Brown ground beef in a pan over medium-high heat. Drain once cooked and allow to cool slightly. Toss lettuce, onions and mushrooms in a bowl. Top salad with ground beef (slightly warm). Serve ranch dressing on the side. I love this recipe and have made it for the second time in a week. I attached a picture to show how refreshing and healthy it can be when place in a lettuce leaf. Who needs the bun anyway?? I didn't miss it for a split second. Sounds great. I will use the Light Ranch - cannot handle the Fat Free Ranch Dressing. I think this would be good w/ mayo (or full fat ranch for atkins) as well, I'll try it soon!!! Sounds great, and it can be altered easily to fit any diet. You leaner meat, non fat cheese and dressing, and Im sure you could even use your own choice for the dressing even. Yummy!! Looks yummy! Love the addition of the portobellos! It's only 5 points a serving...fine for WW. My hubby will love it and he will be able to have 2 servings! Thanks! Looks yummy! Not a good WW recipe...the fat content is too high and the fiber too low. 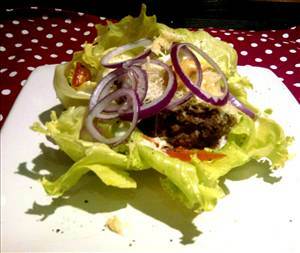 There are 243 calories in 1 serving of Cheeseburger Salad. Calorie break-down: 48% fat, 19% carbs, 33% protein.